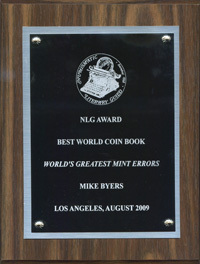 Mike Byers, author of World’s Greatest Mint Errors, was presented with the Numismatic Literary Guild (NLG) award for Best World Coin Book at the NLG Bash of 2009! World’s Greatest Mint Errors is fully packed with some of the most dramatic, rare and extraordinary mint error and die trials ever assembled in one publication. This book delves into the details of every coin and describes the minting process that created them. Each chapter includes the most accurate price guide available, providing anyone interested in error coins with the latest information from the Unites States and around the world. 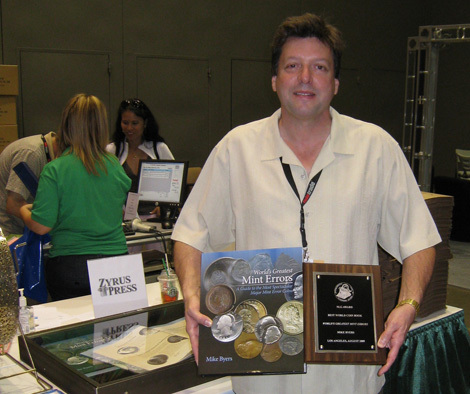 In addition to being the author of NLG award winning World’s Greatest Mint Errors, Mike Byers is president of Byers Numismatic Corp., the largest dealer of the world’s rarest mint errors. In the last decade, Byers has made more discoveries of major mint errors both in the United States and around the world than any other dealer. Byers is also the sponsor of two websites, mikebyers.com and minterrornews.com, both devoted to bringing the latest mint error news and information to the collector. The Numismatic Literary Guild was founded in 1968 to honor excellence and bestow recognition to those who have contributed significantly to numismatic literature. Every year the NLG receives submissions from authors, publishers, and editors for their entries to be considered for an award in various categories. A panel of numismatic editors and qualified individuals judge the entries and the awards are presented at the annual NLG Bash. This year the NLG Bash was held at the American Numismatic Association’s World’s Fair of Money in Los Angeles, CA. Copyright Ⓒ 2009 minterrornews.com. All rights reserved. Legal notice.